Faisel Bashir, founder and CEO, FittPass and Heba El Daleel, co-founder and CCO, FittPass. As you read this article, most likely sprawled on your couch or slouched over your laptop, you should know that in today’s digital age, the very same tech devices can also help you get moving. If you are someone (like me) who doesn’t understand the need to sign up a long-term contract with gyms in order to get fitter, imagine having an à la carte sort of fitness model that helps you indulge in any preferred fitness activity in your city without having to commit long-term? If that excites you, you’d jump at the merits of UAE-based fitness tech startup FittPass. Motivated by a belief that one of the biggest barriers to people adopting a healthier lifestyle is “the fact that traditional model of yearly membership doesn’t work for everyone,” FittPass has created a pay-as-you-play flexible model, providing short-term passes for various health and fitness activities. To match today’s dynamic lifestyles (which find no support from the current rigid gym membership packages), the startup also allows users to search, compare, review and buy passes and memberships online to a host of fitness facilities across the UAE. It is on the back of this attractive premise that FittPass has slowly racked up a user base of more than 15,000 subscribers to date, (and growing) with the startup considering its UAE expansion to have taken shape “quicker than expected.” The company’s primary source of revenue is commission from the passes/memberships sold, and they say that in the last three months, the B2B segment has also emerged as a potential winner due to many corporates taking care of their staff’s wellness and partnering with FittPass for the same. “Once they’re using the gym a few times a week, naturally some [users] will consider taking a membership out. In that way, it’s a source of good quality membership enquiries for the facilities too,” says Bashir. Offering six pass types (one-day, fiveday, 30-day etc.) the startup looks beyond gyms, and includes packages to health clubs, pools, group exercises etc. Similar to the kind of fitness programs it advocates, the startup focuses on remaining flexible with its business model too, and sensing an increased preference for qualified personal trainers in the region, the company has added features to search their platform for such trainers, and directly buy packages online, thus ensuring they become the go-to destination for sports and fitness in the UAE. With the sports and fitness industry in the MENA region estimated to be a US$5 billion industry, and as the preference for boutique fitness studios picks up among the current consumer, quite a few global and regional startups -such as FittPass- finds themselves to be in the right place and time to start and scale their businesses. FittPass on web.Image credit: FittPass. “Actually we were the first ones to launch out of the MENA region, and after we went live, almost 14 similar startups launched,” says Bashir. “But to our good fortune, we were extremely aggressive in our acquisition of partners and building the relationships we now have with our partners, and that is what we believe is our core differentiator,” he adds. His ambitions also seem to be turning into reality as the startup is currently edging closer to listing over 100 fitness facilities on its portal, with around 1,000+ fitness passes made available for customers to choose from- a metric that, Bashir says, is growing by 15% month-on-month. While this performance may indicate a smooth sailing for the startup, disrupting the “ageold gym membership model” has not come easy for FittPass. For starters, changing the mindset of business owners or managers in the sector, who see no value in the industry moving online, has been the startup’s biggest roadblock. “There was a lot of initial resistance, and fear of losing control, which slowly but surely shifted to become very strong relationships with our partners,” says Bashir. Even while tackling such challenges, it’s important to note that the fitness marketplace stays bootstrapped till date, and says external fundraising has become a priority only in recent times. “We are looking to close our pre-Series A round of $1.2 million by the end of the year, and we are about 55% away from our goal,” notes Bashir, without revealing any other details. Given the size of the fitness-conscious community in the region, it’s safe to say that FittPass has a large share of the pie still left to attract, and the startup too seems to be aware and accepting of that fact. Among its key priorities in the short-term are to increase the number of both the subscribers and fitness partners on their platform across the UAE, and to “continue being extremely relevant to [their] consumers,” by listening to their preferences in terms of activities like rowing, kite surfing, diving, and other sports. “We definitely want to grow our footprint to other markets, and our priority market will be KSA, and we will be there by Q1 2018,” says Bashir. Hiring great talent who “fit the work environment, and make [them] a better organization” is also something that the startup has its eyes on. As LinkedIn co-founder Reid Hoffman once said, a focus on tackling neglected problems rather than dramatic problems helps in scaling a business, and going by this, FittPass with its simple but essential business proposition seems to be poised for growth. As for the startup’s own strategy to scale up, Bashir says: “As we grow, we are keen on keeping our eye on the ball, which in our case, is the consumer and the consumer experience. Therefore, the larger we become, the more complex the customer needs become, and the more important the customer experience becomes.” So, what are you waiting for? Get moving with FittPass! 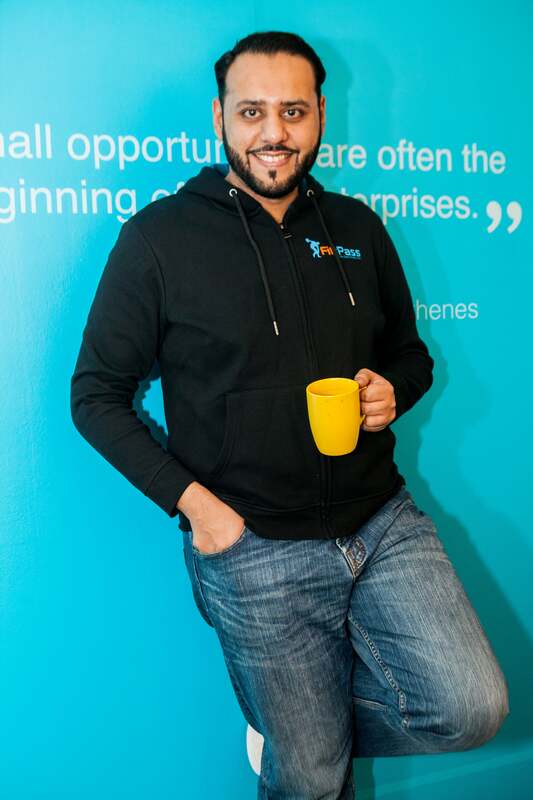 Faisel Bashir, founder and CEO, FittPass.Image credit: FittPass. What are your views on the MENA entrepreneurship ecosystem, and specifically the business environment in the UAE? What are your top tips for an entrepreneur to start a business here in the MENA region? What would be your tips for the region’s aspiring entrepreneurs pitching for funds?